No Problemo? BIG problemo if you're trying to park anywhere near this popular Mexican restaurant. 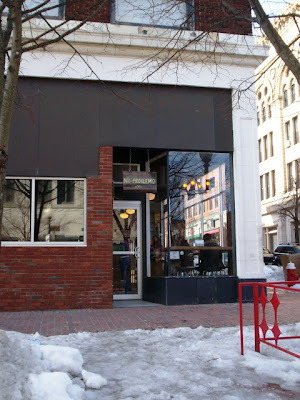 We were in New Bedford to do the second in our trio of this whaling city's many eateries. Our first entry was Me & Ed's, where we indulged in Italian and seafood. 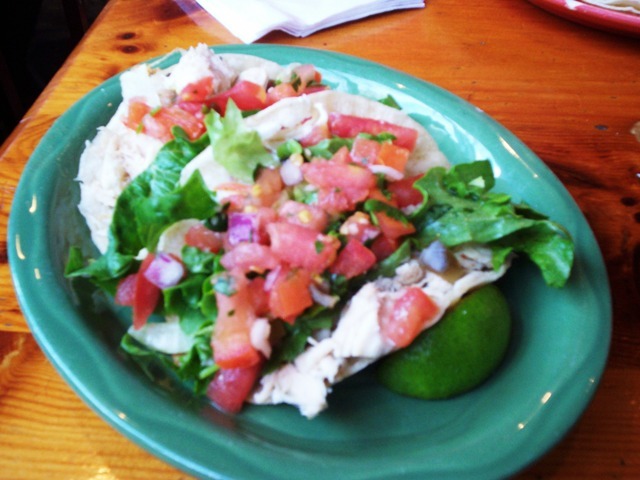 This time we're going for Mexican - Laura's favorite. We've only heard good things about this place. 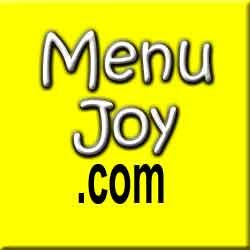 People rave about the freshness of the food and of course, the taste. We heard they do a lot of catering for local events. So around noon on an unusually nice Monday, we took the ride to New Bedford to see what the fuss was about. No Problemo is located right in the heart of the city. Parking is at a premium on these tiny cramped streets, but with piles of snow lining the curbs ... oh my. We went round and round and thought we were going to have to forget about it (like we had when we tried previously). Then there it was - a parking spot - right across the street from the restaurant. We pulled in, crunched ourselves against the snow, and high-fived each other in victory. After putting two quarters in the meter, we walked across the street and went in. Now everything I've read about this place emphasizes how tiny it is inside. I've heard most people either vie for the very few seats or get takeout. Maybe they've expanded, but we found that they had two other rooms - one to eat in if you've ordered at the counter, and the other a dine-in area with waitress service. Who knew? Since we didn't know about the dining room with service, Laura ordered our food at the counter and we sat in the middle room reserved for this purpose. 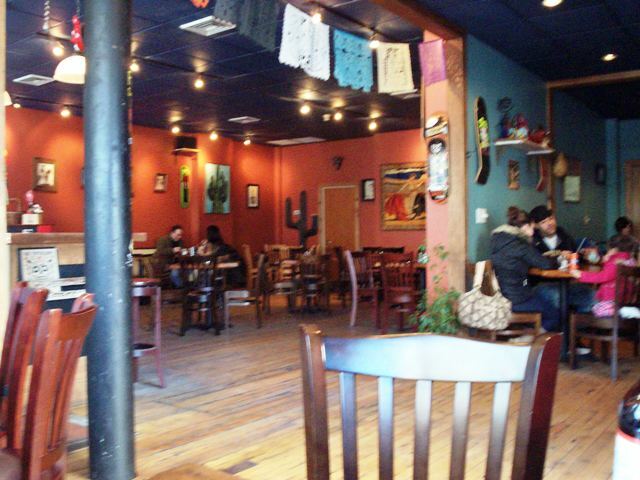 The menu here (see link above) has your usual Mexican faves, but with a modern twist. They have several varieties of burritos, tacos, salads, quesadillas, taquitos, and tortas. Of course, they carry rice and beans, chips, salsa, and guacamole. Also, they serve beer and wine and have a cash only policy. Between the hours of 11 a.m. to 2 p.m., they will not issue separate checks (too busy). If you become a big fan, you can buy a No Problemo t-shirt, hat, or hot sauce. After placing our order, getting our sodas, and joining me in the seating area, Laura remembered she had forgotten to hand in our gift card (from MenuJoy.com) when she paid. She went back and explained our dilemma to the counterman. Maybe this was because he was busy, but he couldn't quite get what she was saying. He reluctantly gave her her $10 in exchange for our certificate, but we think that he thinks he got screwed, lol! Our food was done quickly and Laura went to the counter to fetch it. 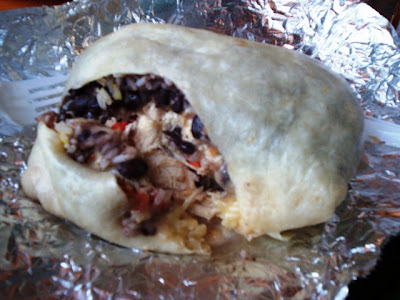 Laura chose a Santa Pepper burrito which was filled with chicken, rice, black beans, cheese, salsa, and sour cream. It was huge. It looked like an over-stuffed hamster and must have weighed over a pound. It was absolutely filled with "stuff " and wasn't a finger food. Laura thought it was delicious but maybe had "too much" rice and beans. Next time, she's asking for it with just the chicken, cheese, salsa, and sour cream. Not that it tasted bad, but she's not crazy about beans and rice. She loves Mexican but not beans and rice - she's so crazy! 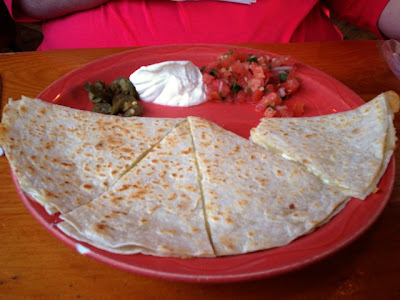 I decided on the three cheese quesadilla which contained jack, feta, and pepper jack cheeses. It was served with salsa, sour cream, and jalapenos on the side. I loved this dish. The three cheeses combined were so tasty and the grilled flour tortilla that held them was soft and warm. I'd get this again. Laura and I also decided to share an order of chicken taquitos. They come two to an order. Now everywhere I've seen them, taquitos are long tubes rolled tight and filled with your choice of meat and cheeses. Well, the taquitos here are like little tacos - an open slightly crisp soft taco shell filled with chicken, lettuce, salsa, sour cream, and lime. I don't know what makes them a taquito; it's really a taco. Maybe because it had no beans? Anyway, they were really good. The chicken was very well cooked and nice and moist. We both enjoyed them. After clearing our table, we headed out to our car. Yay! We hadn't gone over our time limit. Bye No Problemo! We'll be back. THE VERDICT: Good food, though rather mild in flavor. Maybe we should have gotten some hot sauce on the side. The prices are reasonable, but it's a little frantic at lunchtime (seems to be a popular hang out). I'd like to come again to try something else, just not at noon. ... but the total minus our $10 gift certificate was $11.40. Yeah! If you're ever in New Bedford and can find a parking spot, stop in to No Problemo and have a nice meal in a lively atmosphere. We will! No Problemo Taqueria is open from 11 a.m. to 9 p.m. Monday through Wednesday, 11 a.m. to 10 p.m. Friday and Saturday, and 12-8 p.m. Sunday.